Mysterious and intriguing places have a knack of ruling your subconscious mind. Prabalgad was such a place which was at the back of my mind for quite a few months. A first glimpse of it during my hike to Kalavantin Pinnacle had left indelible impression on my psyche and I was looking for an opportunity to visit it at the earliest. Prabalgad situated in between Panvel and Matheran region is a vast fort, mostly covered with thick vegetation and you can visit only part of it and it is advisable to visit it with a guide or expert group since there are chances of getting lost on the fort. I was mulling to join Wild Trek Adventure group for Prabalgad hike on 10th/11th May when my friend Amarbabu Kakamanu , who wanted to start hiking approached me and I immediately finalized the plan to join WTA group along with Amar. We were a group of around 20 trekkers led by Prasad Wagh, a friend and founder of Wild Trek Adventure Group. I was picked up at Wakdewadi, Shivajinagar and other members were picked up at other pickup points like Kirkee, Nasik Phata etc. Few other members from Mumbai were supposed to join us at Panvel. So after picking up them from Panvel, we headed towards the village Thakurwadi, our starting point for the trek. As it was almost 10 pm, we decided to have dinner at a temple before the hike. As we were having a quick dinner of Potato Vegetable, Chapati and Son Barfi, few youths in the village came and advised us not to hike in the night; almost instilling fear and panic among us of the route and offered to provide us a guide. We politely refused the offer as we already knew the hiking trail. We started our hike around 11 pm under a very pleasant moonlight. We hardly needed torches or headlights during the hike. Breeze seemed to have deserted us at the start of the hike but started caressing our faces; invigorating us as we climbed higher and higher. Panvel and adjacent villages, roads were glowing with the lights and it was pleasing sight for the eyes.Though there were novices in our group, all did pretty well and we only took 1 to 2 breaks along the way and reached on the plateau within 70-80 minutes. During my last hike to Kalavantin Pinnacle, our group had halted at Prabalmachi village. It was a nightmarish experience and we were deprived of the sleep as a result of the incessant cacophony of the barking dogs and irritating early morning crowing of the roosters. I was relived when our trek leader Prasad confirmed that camping wouldn't be in the village but it would be on the plateau, in the open, just before entering the village. I was thrilled with the idea of sleeping directly under the sky, watching millions of glistening stars. To our dismay, a small group was already camping on the plateau and they had brought the electricity generator and were doing something strange under the floodlights illuminated by the generator. We initially thought why on earth these people had taken so much efforts to bring generators instead of enjoying the natural, soothing moonlight. We even thought that they were drunk and were partying only to realize later that they were shooting for some kind of a short film. We chatted for a while and chose a flat ground to camp on. I immediately slipped inside the sleeping bag to have a much deserved rest. The cold mountain air washed away all the fatigue and gradually I went into the deep sleep while few members preferred to chat, do some night photography. I slept for almost 6 hours at a stretch and when my eyes opened, it was just before the sun rise. I was contented to have a sound sleep. It was the first time that I slept so peacefully inside the sleeping bag. We chose a small house at the end of the plateau where we were provided water to get refreshed. Sky suddenly became overcast for a while and I got a nice photograph of Kalavantin Pinnacle from the backyard of the house. Soon, it was time to have a hearty breakfast. Maggi was just getting cooked and we freshened ourselves and gorged on the sumptuous Maggi. Though I am not a big Maggi fan, I am not too fussy about having it during the treks. Tea followed the Maggi and we were ready to start our hike. We had the worst possible start for the hike when we lost our way right at the start. We missed our first turn for the hike and walked for about 10 minutes to realize that we had come far away from the starting point. Soon, we retraced our steps back and found the correct route to start our hike. Just before reaching to the top, on the left side, there is a cave. You need to almost crawl to explore the cave. It was pitch dark inside and I decided to venture inside with few other trek mates with my headlight on. We almost went 10 to 12 ft inside and came back immediately as it was suffocating and humid inside. Many of the trek mates preferred to wait inside. As soon as reaching on the top, we had a nice group photo. Shende uncle, aged 57 years was the eldest member (age wise) though he could have given run for money to any youngster with his energy and enthusiasm. Youngest member was Rohan Patil who just had finished his 12th exams. Though he was the youngest, he was well ahead of many of the trek mates with the number of treks he had done before. Reshma Raut (soon to be a certified mountaineer), Sneha and Smriti were the female members. One of the main purposes of this hike was to witness the breathtaking view of Kalavantin Pinnacle from top of Prabalgad. As it was still early in the morning, there was some possibility of watching it in the morning light. So I urged Prasad to visit it first and he readily obliged. The whole plateau of Prabalgad is rich in woods. To reach to the Kalavantin View point on the North side, you need to walk for about 3 kms through the thicket. You can follow a dirt path; at certain stretches path is covered with a carpet of leaves; but we did not find much difficulty to reach to our destination. It was absolutely stunning to watch Pinnacle of Kalavantin piercing the sky. The whole pinnacle was visible from top to bottom with all the zig-zag steps clearly visible. A whole Matheran range of the forts (Haji-Malang, Tawali, Nawra-Nawri pinnacles, Mhaismal, Nakhind, Peb Fort, Matheran plateau ) is visible and it is one of the most astonishing sights in Sahydari. After spending few minutes with a bit of photography, we decided to explore the other part of the fort. Again it was a walk in the woods. We hardly experienced any sunshine because of the thick vegetation which was such a relief considering the oppressive heat outside. On the way, you come across a small Ganesh idol. We took a small break here. Soon, we reached to the dead end of the Southern side. Here, one can witness Irshalgad, Matheran plateau and Kal Buruj. We replenished our water supply from a small water cistern. Here, the water was so refreshing and cool. Don't go at the looks of it. After walking for many miles in the sweltering heat, we were sapped of our energies. Still, some people rushed to the base for having the lunch. I chose to stroll slowly and at one point, perched on the rocks under a tree to hear chirping of the birds. A cooling shade and chirping of birds quickly rejuvenated the mind before I was joined by few other trek mates. Not much of water was left; whatever was left had become warm and we were thirsty and slightly peckish as well. And to our ecstasy, we spotted many trees of Jungli Karvand. We gorged on these karvands till we got satiated. Having trekked for the first time, heat and fatigue took severe toll on Smriti and she suffered from bad cramps. With a lot of coaxing and help, she was brought back to Prabalmachi village. Finally, we reached to a place (same house where we refreshed ourselves in the morning) where lunch was being served. I saw contented faces of our other trek mates who had come much earlier and just finished the hearty meal.Our host served us great food and we happily gorged on the much needed food. It was becoming exceedingly hot and humid. As I already had done Kalavantin just few months ago, I chose not to repeat it in the growing heat and decided to rest in a small hut. I joined couple of other guys who also chose rest over climbing Kalavantin. Quintessential rural music – loud and catchy was in the air which disturbed the silence of the village. Everyone attending the marriage was gaudily dressed; dark green seemed to the favorite color of sarees and dresses. I was appalled to know that the bride was 15 yrs old and groom was 16 yrs old. 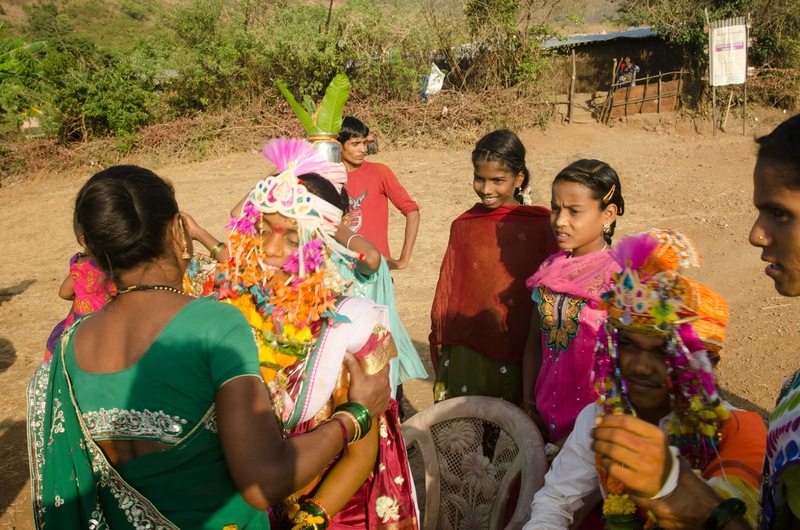 It is really an unfortunate fact that child marriages still exist in Maharashtra. Probably, the inaccessibility of the village might be the reason that people are still ignorant about the ills of the child marriages. After resting for a while, some of us started descending without waiting for others who had gone on Kalavantin Pinnacle. There are idols of Lord Ganesha and Lord Hanuman on the outskirts of the Prabalmachi Village. As we were descending, I came across a couple with a small kid who seemed to be on their way to Prabalmachi. I struck up a conversation with the family to learn that the kid was sick and they had come whole way down to take him to the doctor. I was speechless and flabbergasted to know the plights of the villagers who even don't have the basic medical facility at their village. Really sad state of affairs! Soon, few of us were back to our parking spot. Looking back, both the forts - Kalavantin and Prabalgad were looking resplendent in the slanting golden rays of the evening. Till the other members joined, we enjoyed chatting and witnessing the beautiful sunset. Though the sunset was witnessed from the flat region, it was still beautiful. We almost waited for more than an hour till each and every member reached to the base. As our bus was going to drop Mumbai trekkers to Panvel which was on the opposite direction from Pune, most of the Pune members got down to enjoy some snacks and Tea till bus came back. We finally reached Pune safely around 9 p.m. savoring the amazing experience of the hike. 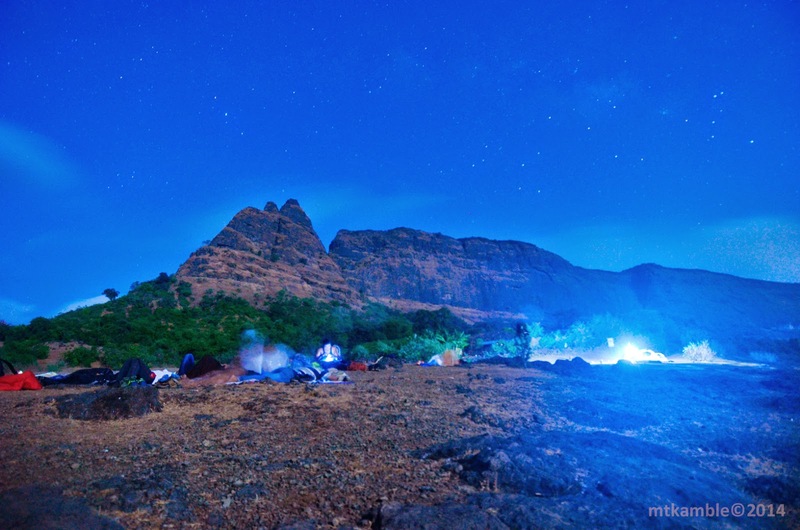 A pleasant hike during the night, luxuriating in the splendid views of Kalavantin Pinnacle, walking in the woods under the dark shades in the hottest month of May, marveling at the great sights of Irshalgad and Matheran plateau made the hike truly remarkable. Prabalgad, situated in the picturesque surroundings of the Panvel region leaves you spellbound with its thick forest, great panoramic views and rich history. No food facility on the fort. This hike can be combined with hike to Kalavantin Pinnacle. Read my earlier article on Kalavantin Pinnacle here. Very nice blog as usual ... But it seems I need to update my English as well since few words are getting bounced from my head. Very well written and once again created a virtual tour in front of me. About the place: Machi Prabal is an ancient and beautiful village situated half-way up a mountain (a ledge or "Machi" in Marathi) at the base of “Prabalgad” fort. With excellent scenic beauty and serene environment, you will witness eternal bliss in your visit to the place. It is housed perfectly in between the two magnificent ancient forts namely “Prabalgad” and “Kalavantin” famous for its historical secrets. Notably, Kalavantin has been named in “33 Most Beautiful Abandoned Places in the World” (http://www.buzzfeed.com/awesomer/the-33-most-beautiful-abandoned-places-in-the-world#.yqlopl5xPX) which has a peculiar design of steps creating a heaven like experience while climbing. This place has been especially attracting a number of tourists, trekkers, historical enthusiasts and also been a perfect weekend for innumerable families housing in and around Mumbai, Pune and Thane. To fully explore this place, you will need at least two days. is parking for two wheelers at early morning available at the village?